Give Me Cake, or Give Me Death. This is the type of cake that makes you change your mind. Your co-workers birthday party? No thanks. Your co-workers birthday party with this double chocolate layer cake? Yes. Please. Your bratty neighbors bar-mitzvah? No thanks. Your bratty neighbors bar-bitzvah with this double chocolate layer cake? Yes. Please. This cake is insane. It’s moist, rich, decadent, mouth-watering, awe-inspiring. Granted, I messed up my first attempt (which actually wasn’t a mess-up because it turned into the delicious cake pops) but I learned my lesson. Follow the recipe, put wax paper on the bottom of your cake pan, voila! If your into making cakes, this is just one of those recipes that you HAVE TO TRY. You’ll be happy you did. 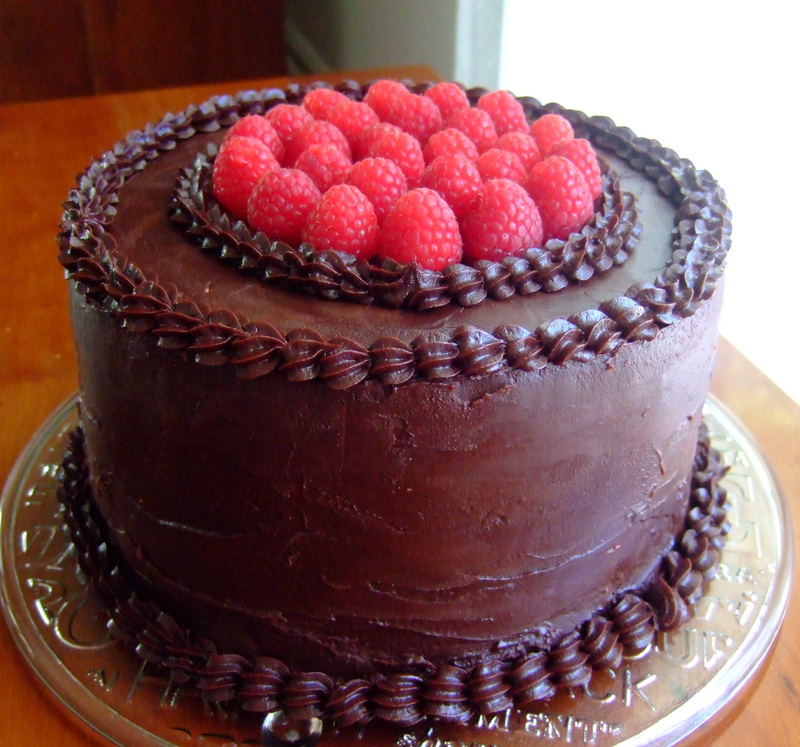 I added a raspberry filling, but you can just keep it chocolate on chocolate and it’s still delicious! Heat oven to 300 degrees and prepare baking pans by greasing with butter, covering the bottoms with wax paper, and greasing with butter again. Finely chop the chocolate and mix with the hot coffee. Let mixture sit and stir occasionally, until chocolate is melted and the mixture is smooth. In another bowl, using an electric mixture, beat the eggs until light colored and slightly thickened, about 3 – 5 minutes. Slowly add the oil, buttermilk, vanilla, chocolate mixture, and beat until combined. Add the sugar mixture and beat until just combined. You can finish mixing with a spatula if any flour remains on the side of the bowl. Divide batter evenly between the pans, place in the center rack of your oven, and bake until a toothpick inserted in the center of the cakes comes out clean. About 1 hour to 1 hour 10 min. Cool layers completely in the pans on a wire rack. When cool, run a knife around the edges to release the cake from the pan. Invert the pans onto racks and carefully remove the wax paper from the bottom side. Finely chop the chocolate. In a 1 1/2 to 2 quart pot, bring cream, sugar, and corn syrup to a boil over medium heat. Whisk until sugar is dissolved. Remove from heat and add the finely chopped chocolate, whisking until the chocolate is melted. Cut the butter into a few pieces and add to the mixture. Whisk until smooth. Puree the raspberries in a food processor. Heat the puree, sugar, and cornstarch in a small pot while stirring constantly. Heat until the mixture boils and thickens. 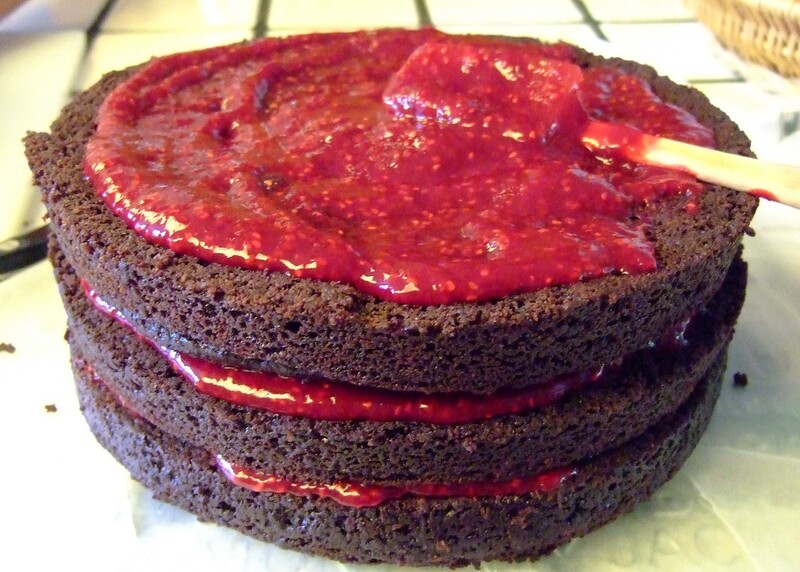 Let it cool completely before spreading between the cake layers. ← Once Ya Pop, Ya Can’t Stop! I have to remember to bake this! It looks killer!